i actually wore this out this last weekend and it was just chilly enough that a jacket was necessary (believe it! ), so i decided to play down the sequins with a denim jacket (i've been wearing my denim jacket with everything these days, obviously!) i actually kind of fell in love with the look and may have to pull it out again for a date night in the future! denim jacket: nordstrom (similar), clutch: h&m (similar), necklace: c/o caja jewelry, nail color: mac's "ablaze"
Oh wow those pants are incredible! Perfectly paired with the denim jacket too. You look amazing! Love those pants so cute!! Every single outfit of yours is my favorite! This is amAAAzing! Love this outfit and how perfect that those pants are so cute and so comfortable! Fancy pants, indeed!! Such a great outfit!!! Such a fantastic outfit! I love all of your looks but this takes maternity wear to a whole new level! 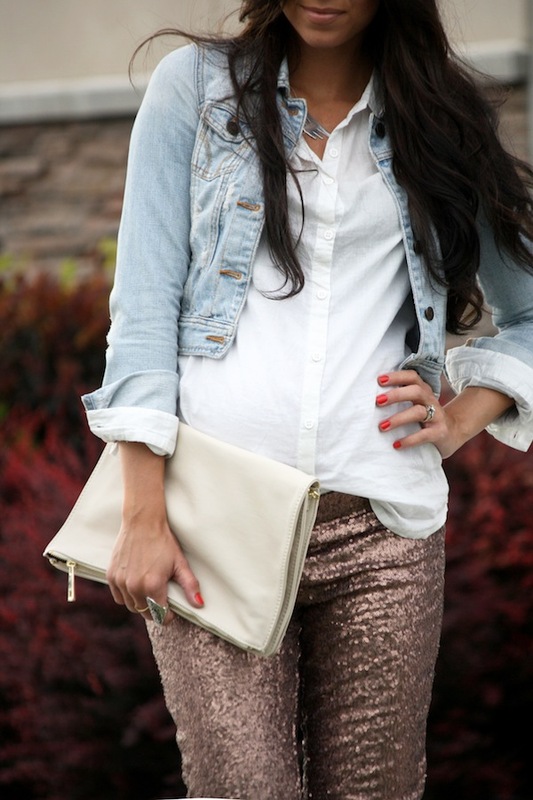 The pants look so glam and cozy...can't beat that combination! your hair looks gorgeous and I love this look! Lalalove this entire look! Such a super cute momma. Absolutely love this look! I've been looking for the perfect pair of sequin pants, and now i've found them. Thank you! Those are so fun to have around for special occasions! Darling! Those pants! And look at your baby girl! So cute! Those pants are so cute! I have to get some like those.